Last updated by Marcia Mayne at December 28, 2015 . Christmas is only a day away but with temperatures in the 60s here in New York, if the city hadn’t decked itself out for the season as spectacularly as it has, you might be tempted to think it’s Spring. To be honest, I’ve been a little preoccupied with work – and a cold that for the last two weeks has stubbornly refused to clear up. A few weeks ago, though, I read Michele at Malaysian Meanders’ post about Saks Fifth Avenue’s Enchanting Holiday Windows and was inspired. I was also surprised, pleasantly so, to see a place I’m familiar with through someone else’s eyes. Instead of rushing past Saks’ window, as I normally do, after reading Michele’s post, I slowed down and looked, not just at Saks but also at the city. I started looking at the decorations with different eyes – how long it takes to plan each show, how many people and time it takes to decorate and dismantle each display, what electrical cost might be, etc. One Friday evening after work, I walked by Saks to take some photos and was surprised by the crush of people who had gathered outside the store to look at the windows. There was hardly room to walk as people stood cameras in hand, mesmerized by the light show which is synchronized to Christmas music. Being rush hour, traffic practically inched along Fifth Ave. But it was worth standing on the corner of Fifth Avenue and Forty-Ninth Street and watch for while. As the music washed over me, I felt my somewhat indifferent feeling towards Christmas lift. I smiled as I remembered Christmases past. As I walked towards the bus stop that evening, I decided to get out by 7 a.m. to take some photos without the crowds and the traffic. 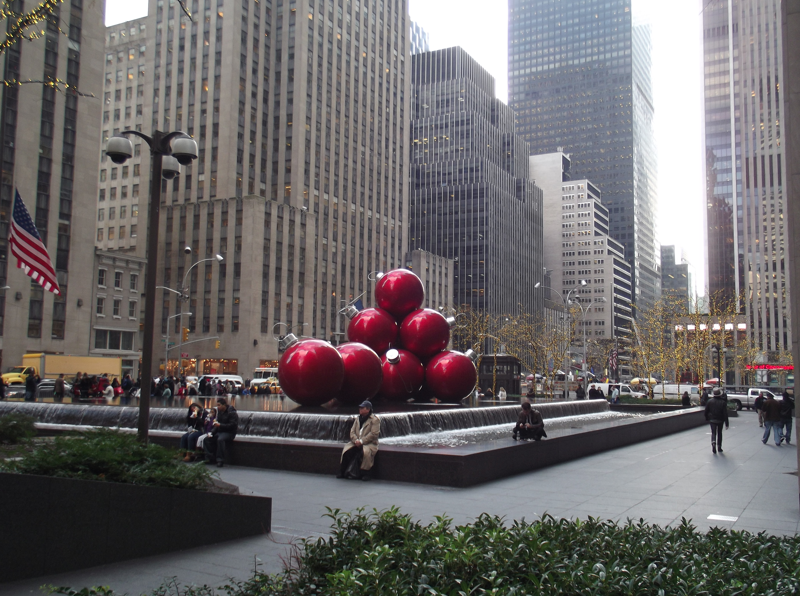 The following morning, I hit the main spots: Rockefeller Center, Saks, 59th Street. 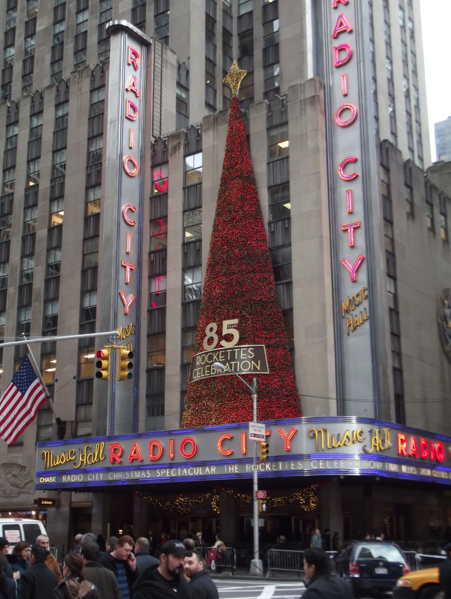 Across the street from Saks is Rockefeller Center and the famous Christmas tree. This is the view towards the Rockefeller Center skating rink. And the view towards Saks. The corner of Fifty-Ninth Street and Fifth Avenue is lined with high end stores, like Tiffany, Bulgari, Bendel’s, Bergdorf Goodman, Burberry, Piaget – you get the idea – and they’re awash in lights. Harry Winston shimmers like diamonds – each window a well thought out setting. How does your city celebrate the season? Linking up this week with Travel Photo Thursday which is hosted by Nancie at Budget Travelers Sandbox, Jan at Budget Travel Talk, Ruth at Tanama Tales and Rachel at Rachel’s Ruminations. There’s no Christmas in Jamaica without sorrel, a drink that is infused with ginger, sweetened with sugar and spiked with white overproof rum. It is as ubiquitous at Christmas time as rum cake, curried goat, and rice with pigeon (gungo) peas. A hibiscus variety, sorrel came to Jamaica from West Africa. According to the National Library of Jamaica website, references to Jamaican sorrel date to the 1700s. Sorrel is an excellent source of Vitamin C. It is also rich in copper, calcium, magnesium, iron and phosphorous. Researchers at Jamaica’s Northern Caribbean University have found that three varieties of sorrel that are grown on the island could be effective in fighting some forms of cancer. Many Jamaicans have the plant in their backyard gardens and some use it not only to make the popular Christmas drink but also to cool fevers, cure colds and lower blood pressure. Its popularity as a Christmas beverage likely stems from the fact that it is harvested around November/December – just in time for the festive season. For many years, sorrel was only available at that time but as the numbers of Jamaicans and other Caribbean nationals living in North America and the UK swell, you will find several different brands of the dried sepals for sale in supermarkets and health food stores. You can also find the bottled beverage available in some Jamaican/Caribbean restaurants. Sorrel is also popular in Latin America. A few years ago, my boss’ Mexican wife introduced me to flor de Jamaica. I was so fascinated by the name of the blood red tea she’d made, it took me a while to realize that the color and vaguely familiar aroma was really sorrel. Unsweetened, sorrel has a sharp, tangy taste. Add a little sugar and it becomes a refreshingly delicious drink. Sorrel can be used to make jams, jellies and chutneys, the leaves can also be used in salads. Cover and let steep overnight. Add pimento berries and refrigerate. Christmas decorations start going up on stores, office buildings and private homes in New York City right after Thanksgiving. The decorations are sometimes simple, sometimes elaborate. No matter, they put a smile on my face and help me get into the spirit of the season. I’m sure they do the same for others, which is why there are usually scores of people milling around. 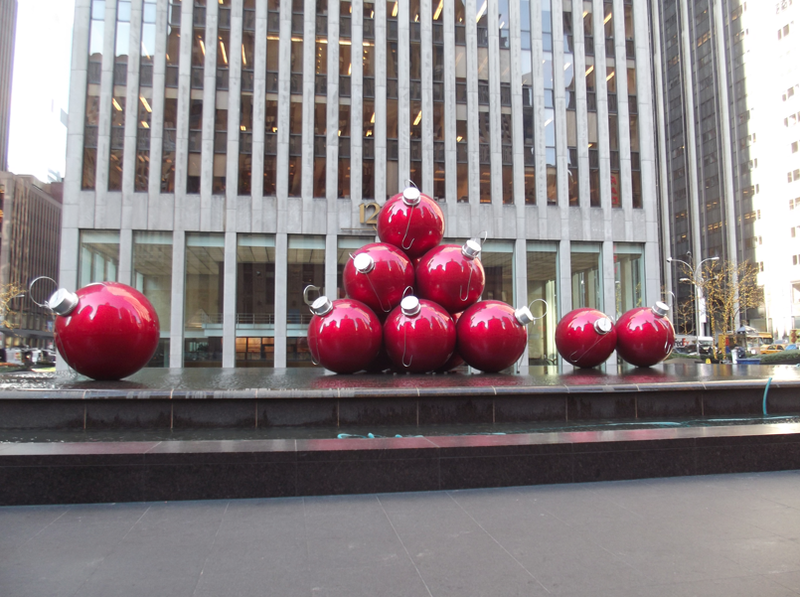 Each Christmas, this building on 6th Avenue near 50th Street decorates with these large red balls but every year when I see them, it feels like the first time (at least to me). A little Christmas magic, perhaps? 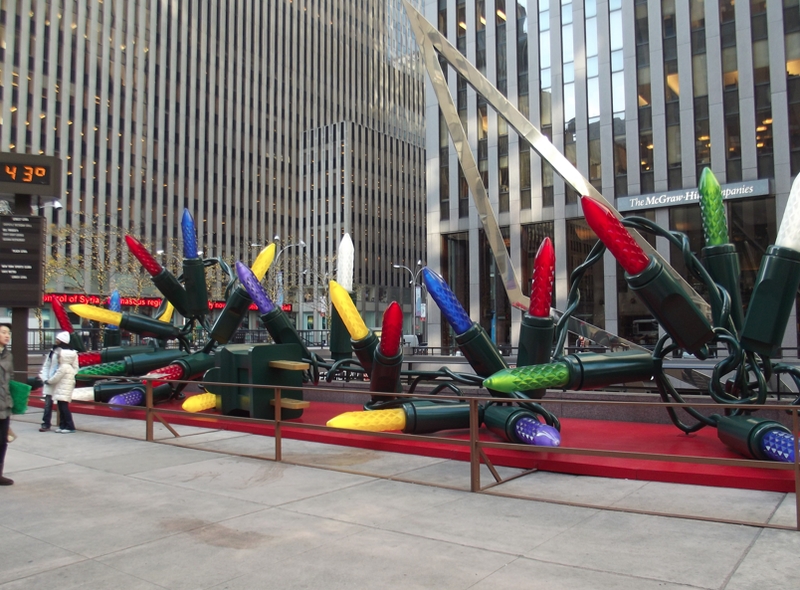 While the weather here in New York is slightly un-Christmassy (rain’s in the forecast today) the decorations definitely are. Here are a few Christmas photos I pulled from the Internet.